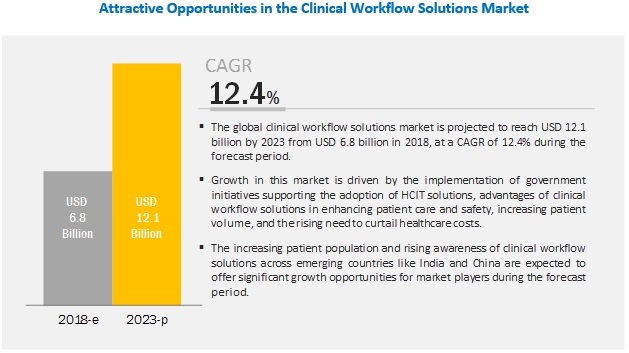 [208 Pages Report] The global clinical workflow solutions market is projected to reach USD 12.1 billion by 2023 from USD 6.8 billion in 2018, at a CAGR of 12.4%. The growth of this market is mainly driven by the increase in need to curtail healthcare costs and the increasing patient volume due to the rising prevalence of chronic diseases. Also, the advantages of clinical workflow solutions in enhancing patient care and safety along with the government initiatives for HCIT adoption are escalating the market growth. Based on products, the clinical workflow solutions market is segmented into workflow automation solutions, care collaboration solutions, real-time communication solutions, data integration solutions, and enterprise reporting and analytics solutions. The data integration segment is further sub segmented into EMR integration solutions and Medical image integration solutions. Data integration solutions accounted for the largest share of the market in 2018. The large share of this segment can be attributed to the growing requirement for a proper management and storage solution that can manage the increasing volume of medical records. Also, the government incentives, penalties, and the necessity to cut costs are contributing towards the market growth. Based on end users, the clinical workflow solutions market is segmented into hospitals, long-term care facilities, and ambulatory care facilities. The hospital segment is estimated to hold the largest share of the market in 2018. The large share of this segment is attributed to the increasing number of initiatives to improve the quality of care delivered to patients and the growing need to improve profitability of healthcare operations and curtail healthcare costs. The clinical workflow solutions market in the Latin America is expected to grow at the highest CAGR during the forecast period. The increasing government initiatives for eHealth, subsequent improvements in the healthcare infrastructure in emerging LATAM countries, rising medical tourism, and growing demand for quality healthcare are factors driving the growth of the Latin America clinical workflow solutions market. Also, the population growth and efforts to improve the quality of care, implementation of favorable government initiatives, strategies to digitalize the country in every sector by using IT infrastructure and the increasing awareness about the benefits of clinical workflow solutions are driving the growth of this regional segment. The prominent players in the global clinical workflow solutions market are Hill-Rom Holdings, Inc. (US), Ascom Holding AG (Switzerland), GE Healthcare (US), Koninklijke Philips N.V. (Netherlands), Cisco Systems, Inc. (US), Stanley Black & Decker, Inc. (US), Cerner Corporation (US), Infor, Inc. (US), Allscripts Healthcare Solutions, Inc. (US), and McKesson Corporation (US). Infor focuses on target specific industries to strengthen its support network with partnerships, alliances, and geographic expansions. It also focuses on expanding its presence in EMEA and APAC, as these countries are establishing the critical infrastructure required to support cloud business applications. The company’s deep expertise and strong market position in targeted verticals; diversified base of customers, geographies and industries; and a broad product portfolio with vertical focus, helps it maintain a leading position in the market. Infor’s global network of partners has enabled the company to ensure a strong geographical presence with 168 offices across the world. Over the years, the company has formed various strategic alliances to strengthen its product portfolio and gain a competitive advantage in the market. At the same time, the company also extended its geographic presence through partnerships with other market players and healthcare IT vendors. The company aims to invest substantially in software product development to enhance their existing products as well as develop new innovative applications. With a marked geographical presence and established brand value, Cerner is one of the key players in the clinical workflow solutions market. The company has a robust product portfolio and an extensive distribution network across the major markets. Its solutions are deployed through care organizations, hospitals, medical centers, free-standing reference laboratories, home health agencies, blood banks, imaging centers, pharmacies, pharmaceutical manufacturers, employers, governments, and public health organizations. Cerner focuses on further strengthening its offerings through acquisitions and product launches. The solutions offered by the company are put forward through its Cerner Millennium and HealtheIntent platform, which helps Cerner to extend its offerings to a broad customer base. The acquisition of Siemens Health Services on February 2015 is one of the major strategic developments which helped the company to expand its product offerings and market presence. The company focuses on enhancing its market share by expanding its solution footprint with existing clients. Cerner also aims to enhance its core solutions and develop new solutions and services. The company also focuses on strengthening its footprints in the non-US markets by enhancing its offerings. In 2018, Infor launched the Healthcare Enterprise Analytics solution and the Infor Cloverleaf Integration Suite 6.2 version. In 2016 Cerner opened a Healthe center at the Cerner Center in Bangalore, India, which helped the company enter the Indian market and also expand its geographic reach. In 2016, Infor, Adobe, and Topline collaborated to form the H3 Solution, which includes AEM from Adobe, Cloverleaf from Infor, and Codeable LanguageTM from Topline Healthcare. In 2015, Cerner acquired the assets of Siemens Health Services, with an aim to expand its market share, enhance its R&D capabilities, and enter into new markets. What are the major end users of clinical workflow solutions market? What are the research areas of the clinical workflow solutions market? Which are the major clinical workflow solutions? Which geographies are likely to grow at the highest CAGR? 11.6 Stanley Black & Decker, Inc.
11.9 Allscripts Healthcare Solutions, Inc. Secondary research process involves the widespread use of secondary sources, directories, databases (such as Bloomberg Business, Factiva, and D&B Hoovers), white papers, annual reports, companies house documents, investor presentations, and SEC filings of companies. Secondary research was used to identify and collect information useful for the extensive, technical, market-oriented, and commercial study of the clinical workflow solutions market. It was also used to obtain important information about the key players and market classification & segmentation according to industry trends to the bottom-most level, and key developments related to market and technology perspectives. A database of the key industry leaders was also prepared using secondary research. In the primary research process, various sources from both the supply and demand sides were interviewed to obtain qualitative and quantitative information for this report. The primary sources from the supply side include industry experts such as CEOs, vice presidents, marketing and sales directors, technology & innovation directors, and related key executives from various key companies and organizations operating in the global clinical workflow solutions market. The primary sources from the demand side included industry experts, such as doctors, nurses, and purchase managers in hospitals. Primary research was conducted to validate the market segmentation, identify key players in the market, and gather insights on key industry trends & key market dynamics. The market size estimates and forecasts provided in this study are derived through a mix of the bottom-up approach (segmental analysis of major segments) and top-down approach (assessment of utilization/adoption/penetration trends, by type, end user, and region). After arriving at the market size, the total clinical workflow solutions market was divided into several segments and subsegments. To complete the overall market engineering process and arrive at the exact statistics for all segments & subsegments, data triangulation, and market breakdown procedures were employed, wherever applicable. Hill-Rom Holdings, Inc. (US), Ascom Holding AG (Switzerland), GE Healthcare (US), Koninklijke Philips N.V. (Netherlands), Cisco Systems, Inc. (US), Stanley Black & Decker, Inc. (US), Cerner Corporation (US), Infor, Inc. (US), Allscripts Healthcare Solutions, Inc. (US), and McKesson Corporation (US).